MASTERCRAFTSMAN (IRE) (Grey 2006-Stud 2010). 7 wins-4 at 2, Irish Two Thousand Guineas, Gr.1. Sire of 460 rnrs, 253 wnrs, 33 SW, inc. The Grey Gatsby (Chantilly Prix du Jockey Club, Gr.1), Amazing Maria, Kingston Hill, Valley Girl, Mime, Even Song, Sacred Master, Thunder Lady, Vague Nouvelle, Master Carpenter, Nakuti, The Centenary, Dessertoflife, Spring Master, Master Apprentice - Master Ceramibo (H.K. ), Choice, Craftsman, Iveagh Gardens, etc. Urulu (f. by High Chaparral). Winner at 2450m in Aust. Roldana (f. by Mastercraftsman). See below. BAK DA CHIEF (Chief Bearhart). 5 wins. See above. Jarilee. 4 wins from 1350m to 2800m, A$111,735, ATC Caterez H., Reece Potter Memorial H., 2d ATC Tradies Gymea H., Pro-Ride H., 3d ATC Australian Turf Club H.
Hayley Grace. 2 wins at 1200m, 1600m to 2015-16, 2d ARC Shamrock Recruitment H., Waikato RC Greene Racing H., 3d BOP RC Phil Mangos-Bayleys Country H.
Old Redfeather. 3 wins from 2100m to 4000m to 2015-16 in NZ. Riverina Girl. Placed in NZ. PONDAROSA MISS (High Chaparral). 6 wins from 1400m to 2100m, NZ$271,635, to 2015-16, ARC Easter H., Gr.1, Coca-Cola H., Simply Squeezed H., Waikato RC The Pathways Immigration Specialists H., 2d Rotorua P., L, 3d Auckland Cup, Gr.1, ARC Zabeel Classic, Gr.1, Waikato RC Arrowfield Stud H., Kingsgate Hotel Hamilton H., 4th ARC Avondale Cup, Gr.2. ECUADOR (High Chaparral). 8 wins from 1400m to 2400m, A$696,100, to 2015-16, ATC Lord Mayor's Cup, L, WJ McKell Cup, L, Eremein H., Grace Removals H., McGrath Estate Agents H., TAB Rewards H., Australian Turf Club H., 2d ATC Epsom H., Gr.1, NSW Tatt's RC Tramway S., Gr.2, ATC Ranvet H., TAB Rewards Royal Randwick H., Kari Aboriginal Resources H., 4th ATC Ajax S., Gr.2, Newcastle JC Cameron H., Gr.3. Prickley Princess. 4 wins from 1400m to 1800m, Taranaki RC Seaton Park H., 3d Counties RC Auckland Thoroughbred Owners Association H.
Moderation. 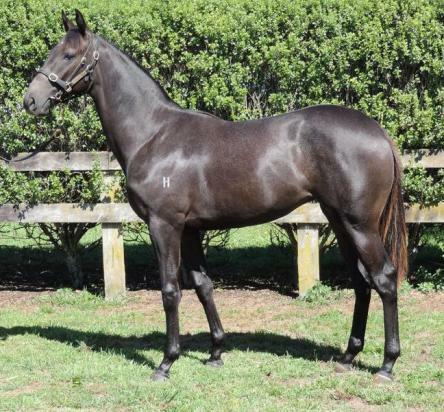 Winner at 1150m in 2015-16, 3d BOP RC Will Johnston-9 to 3 Hits H., Matamata RC New Zealand Bloodstock Insurance Pearl Series H.
Cosmic Angel. Winner at 2000m in South Africa. Producer. ELGAY (Gay Lussac). Joint second on The 1978 Italian 3YO Free H. 6 wins from 1600m to 2400m in France and Italy, Derby Italiano, Gr.1, 2d Milan Gran Premio d'Italia, Gr.1. Sire. DANIELA UMBRA (Ribero). Winner at 2000m, Milan Premio Baggio, L, 4th Milan Premio d'Estate, Gr.3, Premio Legnano, Gr.3, Premio Giovanni Falck, L. Producer. Czaramoony (Czaravich). 7 wins-2 at 2-from 1400m to 1600m, 2d Milan Premio del Dado, L.
Race Record: 5 Starts 0-2-0 A$10,190. Placed at 3 in 2015-16, 2d MVRC Windows by Design P.